Le gare di skeleton alle olimpiadi invernali del 2006 si sono svolte dal 16 al 17 febbraio sulla pista di Cesana Pariol. 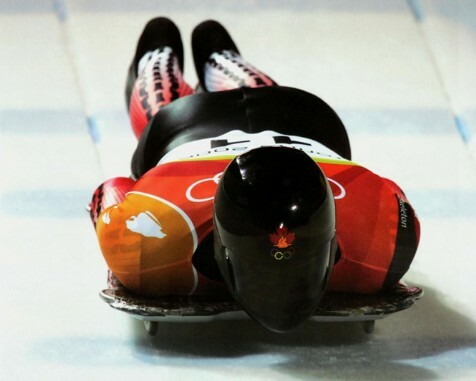 The skeleton competitions at the 2006 Winter Olympics were held February 16 to 17 on the track at Cesana Pariol. Flying head-first on a tiny sled down an ice track isn't for the faint-hearted. Three medals of the six put up for this white-knuckle event went to Canada, including gold to fireman Duff Gibson, a former skater and bobsleigh driver, who fell in love with the Winter Olympics having watched the events at Innsbruck on TV in 1976. Both Gibson's father (judo) and his uncle (rowing) also made Olympic bids (albeit with less success). Gibson finished ahead of Jeff Pain, the Canadian who competed at Salt Lake 2002 to try and make ends meet. He said, "putting food on the table everyday is a huge challenge". Maya Pedersen triumphed in the women's competition. The Swiss athlete with an athletics background is also the first woman to win two skeleton world titles (2001-2005).